The ELD-X bullet is a technologically advanced, match accurate, ALL-RANGE hunting bullet featuring highest-in-class ballistic coefficients and consistent, controlled expansion at ALL practical hunting distances. All commonly used polymer tips in high BC bullets melt in flight.Hornady engineers discovered that commonly used bullet tip materials in streamlined, high BC bullets melt and deform. Although not a significant issue affecting moderate BC conventional tipped varmint and hunting bullets, aerodynamic heating causes BC reduction and degradation of accuracy, particularly at extended ranges (400 yds +). 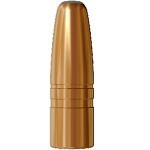 To counter this effect, Hornady identified a heat resistant polymer and developed the Heat Shield tip. This revolutionary new tip creates the perfect meplat (tip) with exceptionally consistent results from bullet-to-bullet and lot-to-lot. Upon contact at extended range (400 + yards), the Heat Shield tip drives backward into the carefully designed nose cavity to begin the expansion process. At these lower velocities, the ELD-X bullet exhibits conventional expansion characteristics with a large mushroom and high retained weight ensuring deep penetration and large wound cavities. 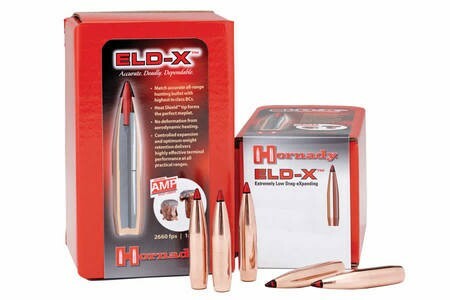 Available as component bullets or in factory loaded ELD-X Precision Hunterammunition, ELD-X bullets are "heavy caliber" and designed for maximum ballistic coefficients, the highest levels of accuracy, consistency and extreme lethality at ALL practical hunting distances. Såg löjligt bra ut på tavlan när jag fick prova den, ska bli spännande att prova denna på jakten i framtiden.